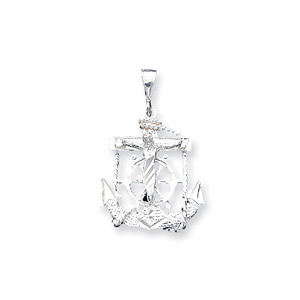 Diamond-cut mariner cross pendant is made of polished sterling silver. Item size: 1 1/8in tall by 15/16in wide without bail. Weight: 3.4 grams. Shaped like an anchor, the Mariner Cross reminds us that Christ is our anchor, our hope. Chain not included. I have seen similar crosses at twice the price. This was a great deal. Exactly what I was looking for and sturdy enough for my teenage son who wears it everyday! !